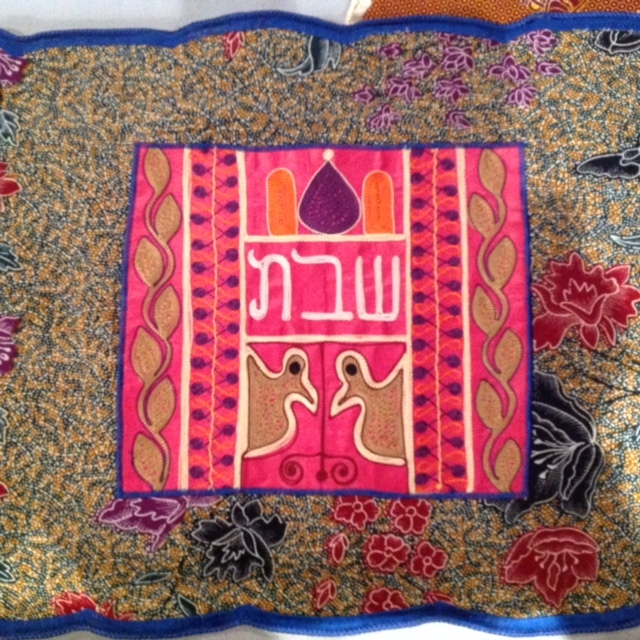 When you use a gorgeous challah cover from Ghana, you are helping to create a connection with the House of Israel in the remote, mountain village Sefwi Wiawso. If you were to celebrate Sabbath in Sefwi Wiawso you would find much that is familiar. You would join members from the 70 or so families in the cinder-block synagogue, painted brilliant blue and white to match the Israeli flag. The men and women, many of whom have Biblical names like Joseph, Joshua, David, Rebecca, and Sarah, wash their hands before the service, and sit on separate sides of the aisle. You would also experience much that might be new to you. The synagogue is set among the cocoa and sugar plantations where many community members work. You’d hear everybody chanting beautiful, but unfamiliar melodies in Sefwi. Although you’d see a Torah scroll it is not used because nobody in the community reads Hebrew. The leader of the community, Kofi Kwarteng, reads from an English language Tanach (a gift from a synagogue in Iowa) and interprets the week’s parsha. Each sentence is read once in the local language Twi, then in English, and finally in a colloquial mix of Twi and English. For centuries, the community has been practicing a way of life that sets its members apart from their neighbours. In 1976 Aaron Ahomtre Toakyirafa had a vision. He saw a connection between those ancient practices — the prohibition of work on Saturdays, circumcision, and the slaughter their animals according to the laws of Kashrut – and Judaism. He determined to trace his peoples’ history, and he educated his people about what he’d discovered. For around 400 years their ancestors had been traders in Timbuktu until they were so persecuted that they had to move to Ivory Coast and finally to Ghana around 150 years ago. The community decided to call itself the House of Israel, and for many years its members thought they were the only Jews in the world. When Aaron Ahomtre died, some people thought that the community might collapse. People no longer met for Torah discussion, and their Shabbat observances all took place at home. However, Mr. Joseph Kwame Nipah helped to organize the people again, and the community has remained solid. Today, though there is still almost no formal recognition of a Jewish presence in Ghana (there is no Israeli Embassy, there is no synagogue in the capital Accra, and there is no mention of Ghana in most Jewish travel guides), but thanks in part to the work of Kulanu, the House of Israel is emerging from its isolation to take its place with Jews all over the world. 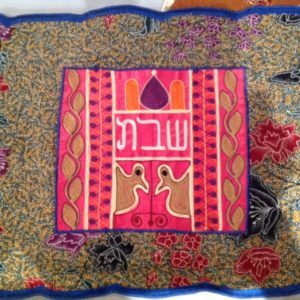 Revenue from the sale of the challah covers is being used by the House of Israel to put up a guest house so that visitors can have a comfortable place to stay. It is an important way for the Jews of Sefwi Wiawso to strengthen their ties with Jews from around the world.